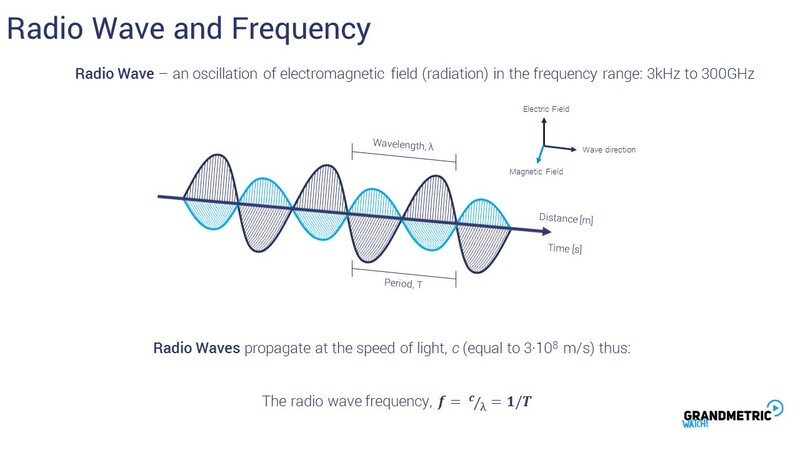 The waves propagate at the speed of light. So in time domain the single sinus cycle lasts for a period T. And inverse proportion of T is F, which is the number of cycles in a second. 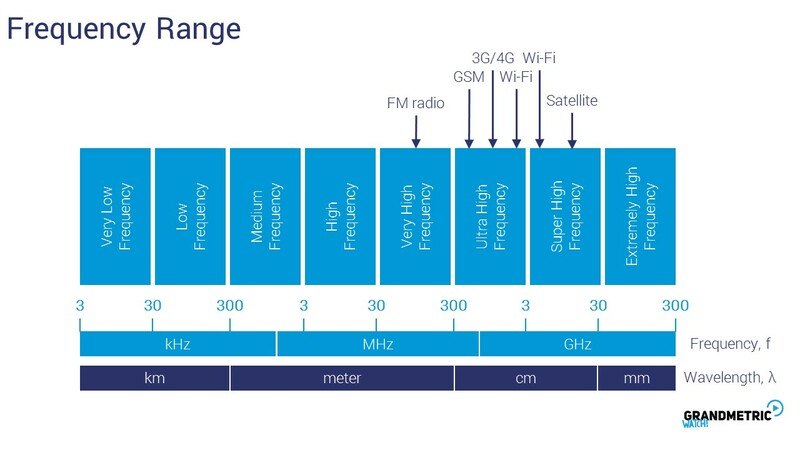 Relation between F & Wave and antenna sizes (why frequency and in result wavelength matters)? To move from the linear values to dB, we simply use 10log of the values. While discussing power, it is worth mentionig how do we handle power in wireless systems. Channel can attenuate signal milion fold, so if we transmit 1W a 0.001 mW is received. 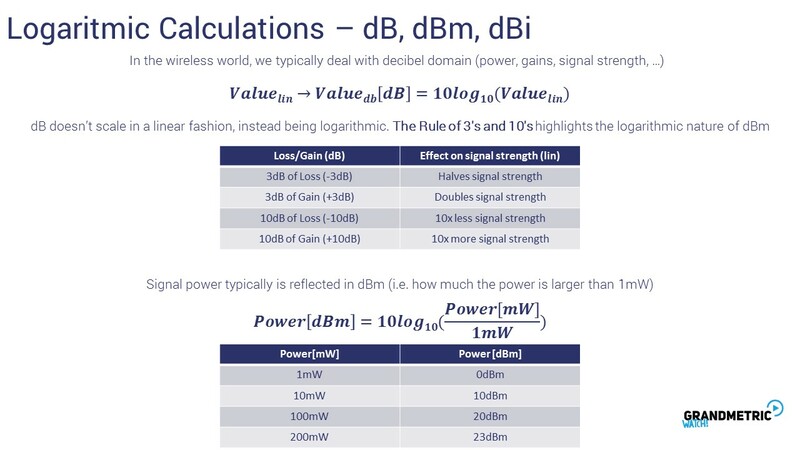 It is very inconviniet to use such wide range of values and that is why we use logarithmic scale, called decibels. In order to understand how decibels work, we will use a reference to the sound volume. Lets start with single speaker, which generates unit volume. This is our reference, so decibel value is equal zero. 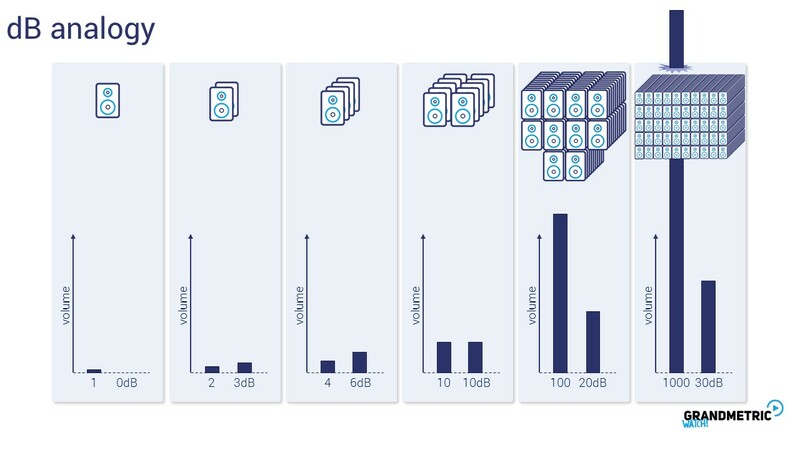 If we double the numer of speakers, the decibels increase by 3. This is thumb rule numer one in decibels -> double power means +3 decibels. So, if we add another two speakers, decibels increase again by 3. Notice, that in first case, 3dB corresponds to 1 additional speaker, but now, 3 decibels mean 2 speakers – this is not linear scale. Let’s make it 10fold again, so we get 100 speakers! This is getting loud. As we learned before, 10fold increase is +10 db, so we end up with 20db. You can already see some benefits, because scale from 1 to 100 changed into 0 to 20. It gets even prettier if we make one more step. Let’s create a powerfull setup of 1000 speakers. It is impossible to show it on our linear scale right now, but we can easily handle it with decibels. It is just additional 10 dB! 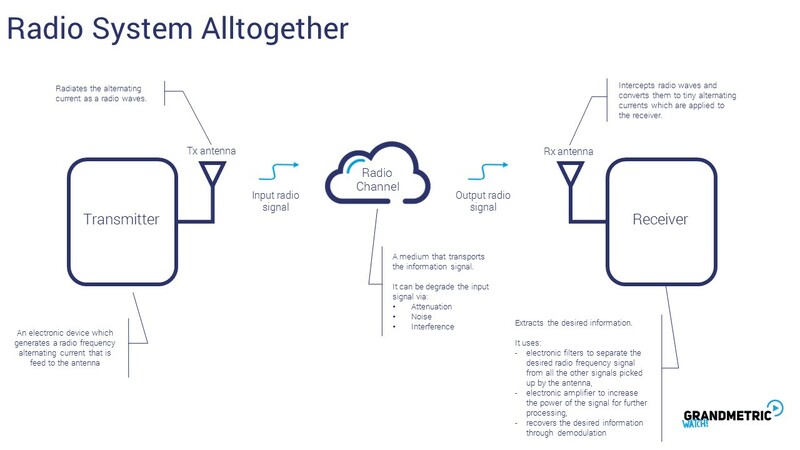 The radio channel outputs the distorted signal (that also can be called an input signal to the receiver) that is received by the Rx antenna that Intercepts radio waves and converts them to tiny alternating currents which are applied to the receiver, which extracts the desired information. 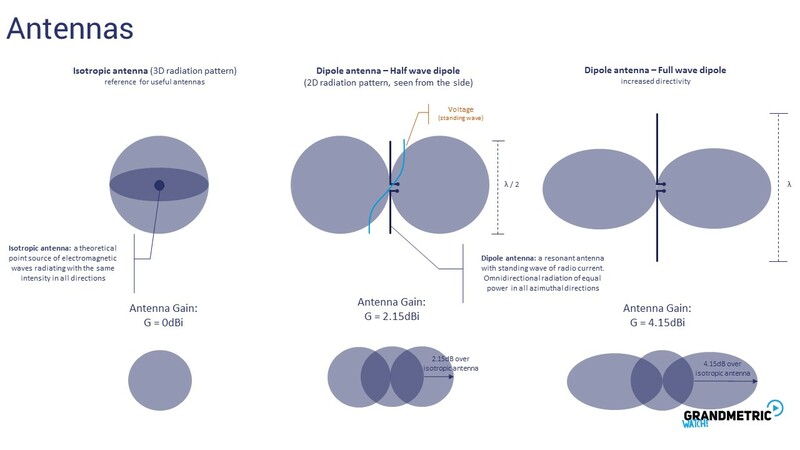 If we increase the antenna length 2x – or use 2x higher freqeuency, we get a full wave dipole, the directivity increases to 4.15dBi. But we cannot go beyond certain lenght, as then the sidelobes start to show up . Sidelobes makes the antenna transmit or receive to /from unwanted directions. Here we show a real life antenna for WLAN (outdoor). We see the top view and sideview and 3D view. 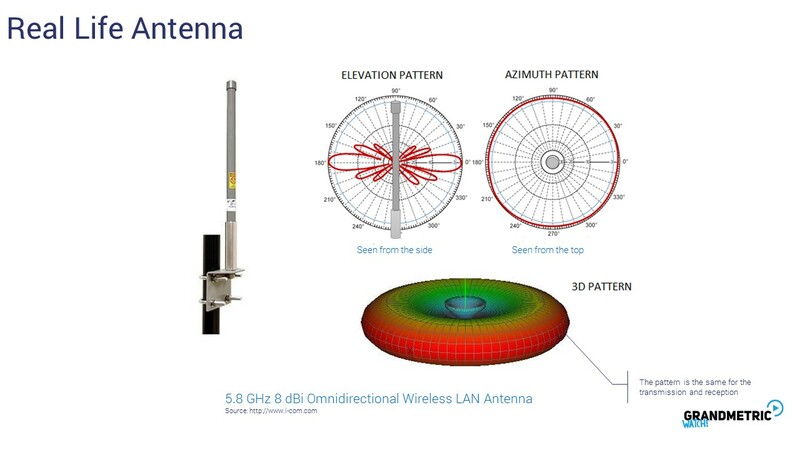 We can see that this antenna transmits in the vertical directions with highest power, we see the sidelobes and from the top the antenna transmits in all directions with the same gain – so it s called an omnidirectional antenna. 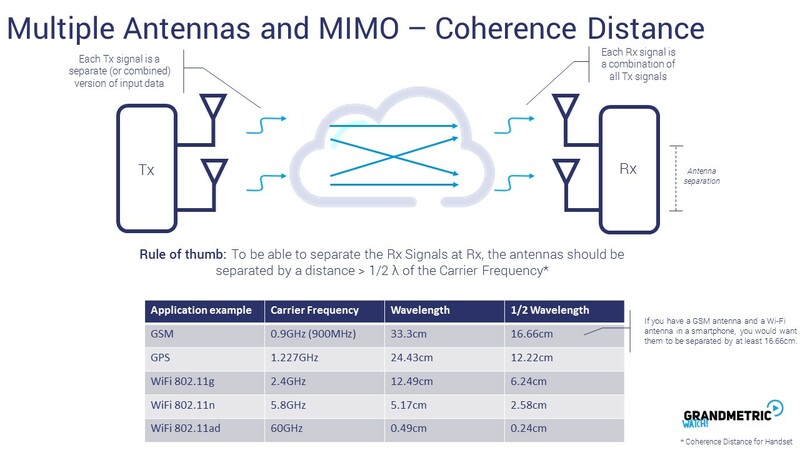 This apptern applies for the 5.8GHz with 8dBi gain. 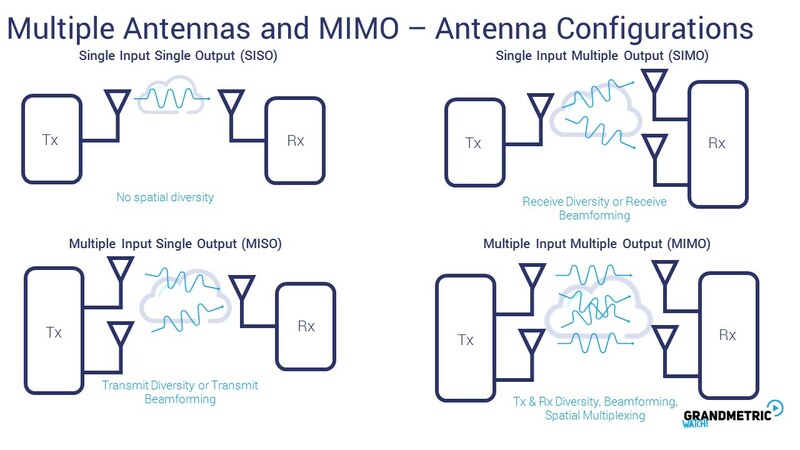 We have multiple antennas at the Tx, and multiple antennas at the Rx and a channel inbetween. 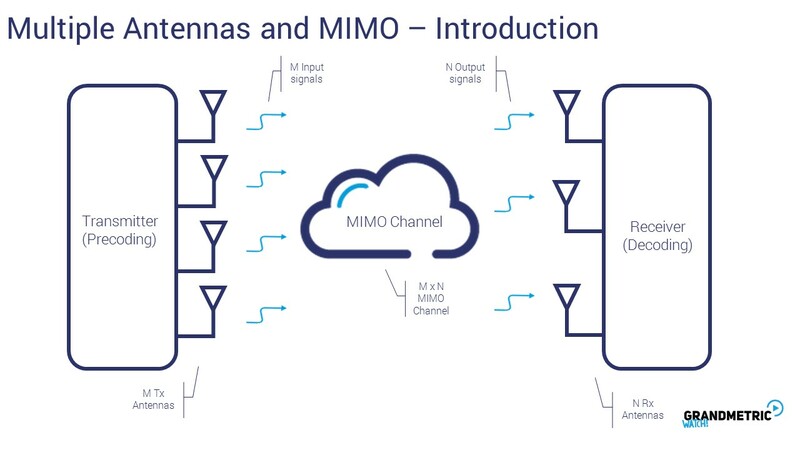 MIMO is the final stage, when we have both multile Tx and Rx antennas, and by this means we could also improve link reliability, or do something else – that in other configurations is not possbile – i.e. 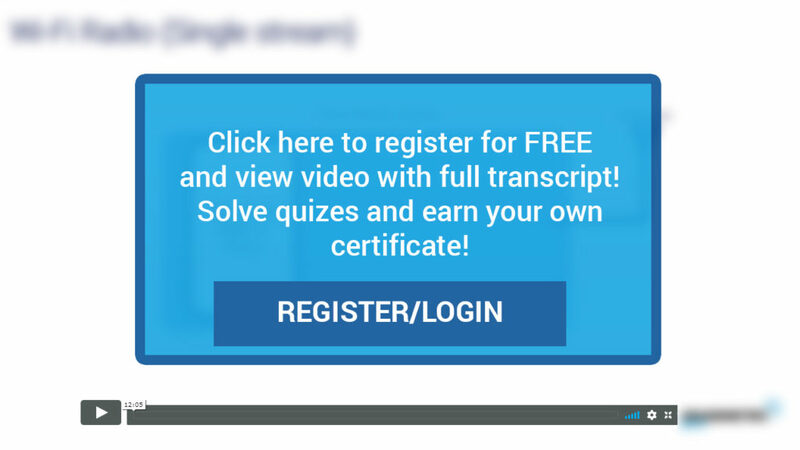 transmit 2x different streams – to increase thrpt.